European Foreign Policies : Does Europe Still Matter? The extent of Europe's influence in the twenty-first century is one of the fundamental questions in a rapidly changing world order. How much does Europe still matter in geostrategic affairs? Will the Europeans seek more international clout and be willing to pay the price for it? Above all, will the European-American partnership prosper or weaken? In the only comprehensive study available on the subject, leading international experts explore these vital questions for global peace and security. 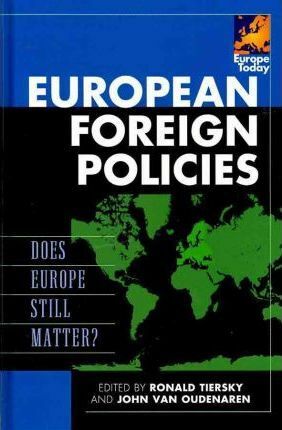 The book includes authoritative chapters on the foreign policies of the major European countries, of the European Union, and of Europe toward key regions and countries-especially the United States, Russia, China, and the Middle East. Ronald Tiersky is Joseph B. Eastman '04 Professor of Political Science, Amherst College. John Van Oudenaren is chief of the European Division, Library of Congress, and adjunct professor, BMW Center for German and European Studies, School of Foreign Service, Georgetown University.